Leaders Lyceum » The Map is Here! From your time with us, you hopefully remember the Leader Level model of Vertical growth which provides us with a “map” for how we can and should continue to grow over the course of our life’s journey. This book both explains in detail what leadership looks like at the different levels and provides you with guidance in how to continue to grow through each level. 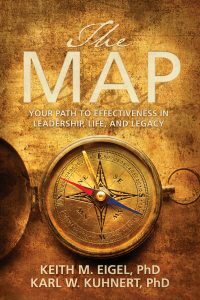 It sheds light on why we often feel stuck and gives us the tools to grow on purpose to a place of greater effectiveness in leadership, life, and legacy. You have been a part of our journey, and we’d love to continue to be a part of yours. If you were impacted in any way by your time with us, we’d love for you to share this book with your colleagues and friends and help them take the next step in their own journey.